The Planetary Health Alliance invites academic and research institutions, non-governmental organizations, and government entities to apply for membership in the Alliance. Membership indicates a commitment to collaboration in planetary health and to involving your communities in PHA initiatives. No financial contributions are required. Opportunities to engage include: attending the Planetary Health Annual Meeting and participating in the membership meeting; getting involved in planetary health education through participating in one of the education working groups and creating new programming at your home institution; engaging in the Clinicians for Planetary Health initiative to help galvanize clinicians and their patients around planetary health; building local community events and discussions focused on public education and storytelling around planetary health; encouraging students to engage in the Emerging Scholars Network and form a local planetary health club; collaborating with other PHA members on research and policy relevant to planetary health; and subscribing to our monthly newsletter to stay updated on the latest planetary health research and opportunities. Subscribe to our mailing list for planetary health-related news. The Planetary Health Alliance is composed of 140+ member institutions representing over 30 countries around the world. 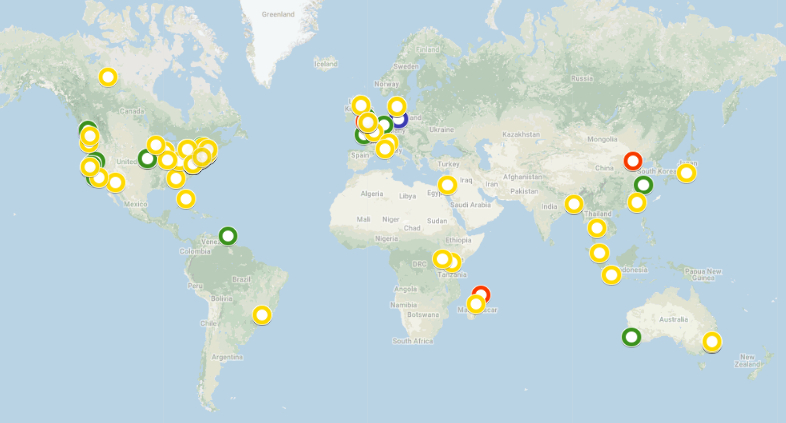 Visit the interactive map below to learn more about member's planetary health education and research efforts.